ADFS is the Advanced Disc Filing System. It is a module that, together with FileSwitch and FileCore, provides a disc-based filing system. Most of the facilities that you will use with ADFS are in fact provided by FileCore and FileSwitch, and you should read the chapters on those modules (on FileSwitch and FileCore respectively) in conjunction with this one. ADFS is a module that provides the hardware-dependent part of a disc-based filing system. It uses FileCore, and so conforms to the standards for a module that does so; see the chapter entitled FileCore for details. the entry points and low-level routines that FileCore needs to access the disc controllers and associated hardware. Except for the low-level entry points and routines (which are for the use of FileCore only) all of these are described below. For a full summary of 'perfect' ADFS formats, see from Disc formats onwards of the FileCore. If you are running a site with a mixture of 1772-equipped 'old' machines and 710/711-equipped 'newer' machines, we recommend that you format all discs on the latter. On old machines, D and E format discs have the sectors offset between sides for speed optimisation. The 710/711 cannot format discs in this manner, and may run slow when accessing such discs. By formatting discs on newer machines, they will run at the same speed on every machine, albeit some 5% slower than discs with offset sectors can run on older machines. Likewise, we recommend that any software you ship uses discs that do not offset sectors between sides (ie the discs are formatted on a newer machine). If you wish to vary the format of a disc to provide software protection, you should follow the guidelines below. This will ensure that your discs are reliably readable and quick to load on all RISC OS machines, current or planned. arbitrarily vary the ID held in the sector ID, within the limits imposed by the 1772 disc controller (but you must then use the altered ID to access that sector - see below). access sectors specifying a different ID to that physically held in the sector ID. 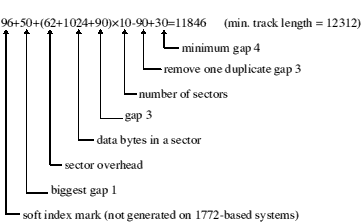 The last point prohibits such common practices as reading a 1k sector with a 2k read (to recover inter-sector data), or reading a track with a different head number to that in the sector ID (which works with a 1772, but fails with the 710/711 used on machines such as the A5000). Only read a single 128 byte sector at a time. For the purposes of formatting, the speed stability of disc drives will be assumed to be 1.5%. 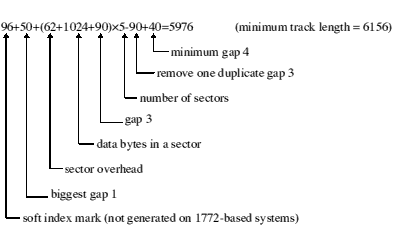 If evaluating the total byte usage of the given formats gives a number less than the minimum track length, then that format fits and will be reliable. The drive speed variation gives 3% variation total (assuming the drive used for formatting was 1.5% fast and for writing is 1.5% slow). The write-to-read times give the further slack needed which gives the minimum value for gap3. The total variation in bytes is in the section of a sector from gap2 to the end of CRC2 after the data. This gives an overhead over the data of 40 bytes. 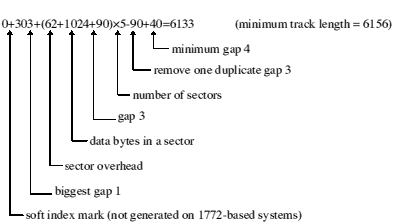 If 'no', does it fit using minimum gap1 and minimum gap3? Does the side/side skew invalidate gap4? Disc changed support should be available on pin 34, and should be resettable with a step pulse. The drive should mask index pulses when selected but without a disc present. The drive should not mask index pulses whilst step pulses are being issued. The drive should support a 'density in' signal (from FDC) that is active high for high density ( 500Kbps). The drive should supply media ID signals that indicate the greatest density supported by the current drive/media. Drives 0/1 should be ready to use within 500mS of motor startup. Drives 2/3 should be ready to use within 1000mS of motor startup. Drives 2 and 3 do not result in any drive select line being asserted, but can be decoded by an external decoder. To help you understand the floppy disc drive interface, this section discusses further the function and use of each of the interface signals. All interface signals are open-collector, and therefore require a pull-up resistor of nominally 1k FOR 31/2" SYSTEMS OR 150 IN OLDER 51/4" systems. The pull-up should be present in one place only - either on the drive furthest from the controller (for outputs), or on the controller (for inputs). Due to the nature of open collector signals no damage will occur if several outputs drive one signal; thus it is safe, for instance, to connect 'motor on' to 'Sel2' and force motor on true whenever Sel2 is asserted. All signals are active (asserted) low, ie active when at 0 Volts. Inputs are only valid when a drive is selected. Used to select the drive; only one should be active at any given time. Most 'AT' compatible drives assume only drive select 1 will ever be asserted, since there is a physical twist in the cable to determine the actual drive number. Asserted to turn the drive motor on (and load the head on 51/4" drives). A period of 0.5 seconds (1 second for drives 2 and 3) is allowed before any data transfer occurs to allow the drive motor to come up to speed. Asserted to step the head in the direction given by DirIn. Also used to reset DiscChanged. A period of 15-20 ms is required to allow for head settling after any movement. Asserted to move the head inwards (to the centre) during head movements. Data from the controller to be written to disc. Qualifies WriteData. Asserted prior to and after WriteData is true to enable recording of the data. Informs the drive of the current data rate. Asserted for 500Kbps and 1Mbps operations (1.6 and 3.2 Mbyte formats). Normally on pin2, some drives may require an inverted signal if intended for use with PS/2 systems. Asserted by the drive when the head is on track 0. Asserted by the drive when the disc is write protected. Data stream read from the disc. Index pulses are produced every disc revolution (200mS). The 82C710/82C711 driver uses the presence of index pulses to detect a disc in. If a drive does not support 'DiscChanged' then in order to function with the 82C710 /82C711 driver it must inhibit index pulses with the drive empty; this is the normal situation. Performance is improved if index pulses are not masked during seek or motor startup. Index pulses must be present within 900mS (1400mS for drives 2 and 3) of asserting drive select/motor on, otherwise the drive will be deemed to be empty. This signal is normally available on pin34 or pin2 and when asserted indicates that the disc in the selected drive has been changed. Neither the 1772 nor the 82C710/82C711 driver require DiscChanged in order to function, but give better performance if available. The signal must never be asserted if non-functional. Dependent upon drive type the disc changed signal may either be reset by issuing a step pulse (82C710/82C711 driver) and/or by asserting the disc changed reset signal (1772 driver). If DiscChanged is reset by 'step', the wimp polling period is set to 1 per second; otherwise it is set to 10 times per second. Often available on 51/4" drives, and available from drives for A440/540 series machines on pin34. Asserted when the drive is ready for read/write operations. This feature is required by the 1772 driver. If not present, Ready must be tied low for the driver to function. Disc errors are errors returned by the controller. The following sections list the disc error codes returned for all controllers currently used in RISC OS computers. &0C ISR Invalid step rate: highest-speed seek specified in normal seek mode. This call is issued by a handler of discs (such as ADFS) to find how to initialise a disc to a specified format. The format specification string is the same as the format parameter specified in the *Format command (see *Format). You should claim this call if your module recognises the format specification string as one that you support. If you do not recognise the format - or if you don't support disc formats at all - you should pass the call on with all registers preserved. For an example of a call used to obtain raw disc format information, see DOSFS_DiscFormat. Similarly, for an example of a call used to lay down a disc structure, see DOSFS_LayoutStructure. F - 1600K, 77 entry directories, new map, Archimedes ADFS 2.50 and above. You should display the list using OS_WriteC or a derivative of that (eg OS_Write0, OS_WriteS etc). This SWI calls FileCore_DiscOp, after first setting R8 to point to the FileCore instantiation private word for ADFS. This call is functionally identical to FileCore_DiscOp. This call sets up the address of the ST5056 hard disc controller to be used by the ADFS. For instance, an expansion card can supply an alternative controller to the one normally used. The controller must be an HD63463 (or compatible). The IRQ/DRQ must be 1 when active. This SWI calls FileCore_Drives, after first setting R8 to point to the FileCore instantiation private word for ADFS. This call is functionally identical to FileCore_Drives. This SWI calls FileCore_FreeSpace, after first setting R8 to point to the FileCore instantiation private word for ADFS. This call is functionally identical to FileCore_FreeSpace. This SWI calls FileCore_DescribeDisc, after first setting R8 to point to the FileCore instantiation private word for ADFS. This call is functionally identical to FileCore_DescribeDisc. This call vets the given disc format structure for achievability with the available hardware. ADFS updates the disc format structure with values that it can actually achieve with the hardware available. For example the only fill byte value available when formatting might be 0, but the requested value may be &4E, hence 0 would be filled in as the fill byte value. If ADFS cannot sensibly downgrade the parameters given in the disc format structure, it will generate an error. in response to ADFS calling FileCore_DiscFormat or ImageFS_DiscFormat (eg DOSFS_DiscFormat) respectively. The value in R1 is used to pass enough information on the hardware on which the format is to take place for the disc format structure to be vetted. ADFS uses the drive number for this; other handlers of discs may pass different information if they implement a VetFormat SWI. This call is for internal use only. It is not available under RISC OS 2. This call returns the controller type of the given drive. This call controls the power-saving features of the ADFS system. It can be dangerous to use this call on drives that do not fully support drive spin control. The controllers on at least two drives tested hang up when autospindown is enabled; a reset does not recover the situation, although a power-on reset does. This call gives the IDE driver the details of an alternative controller. In versions of ADFS supplied before RISC OS 3.5, R4 must be 1 on entry (ie the interrupt status must be in bit 0). This call provides the direct user interface for low-level IDE commands. It must not be called in background. This SWI calls FileCore_MiscOp, after first setting R8 to point to the FileCore instantiation private word for ADFS. This call is functionally identical to FileCore_MiscOp. *ADFS selects the Advanced Disc Filing System as the filing system for subsequent operations. Remember that it is not necessary to switch filing systems if you use the full pathnames of objects. For example, you can refer to NetFS objects (on a file server, say) when ADFS is the current filing system. *Configure ADFSbuffers sets the configured number of 1 Kbyte file buffers reserved for ADFS in order to speed up operations on open files. A value of 1 sets a default value appropriate to the computer's RAM size; a value of 0 disables fast buffering on open files. *Configure ADFSDirCache sets the configured amount of memory reserved for the directory cache. Directories are stored in the cache to save reading them from the disc; this speeds up disc operations, and reduces disc wear. A value of 0 sets a default value appropriate to the computer's RAM size. *Configure Drive sets the configured number of the drive that is selected at power on. 0-3 correspond to floppy disc drives; 4-7 correspond to hard disc drives. Since most Acorn computers have only one floppy disc drive and no more than one hard disc drive, the most common values are 0 or 4. *Configure Floppies sets the configured number of floppy disc drives recognised at power on. The default value is 1. *Configure HardDiscs sets the configured number of ST506 hard disc drives recognised at power on. These disc drives are the standard ones fitted to early models of RISC OS computers (eg the Archimedes 300, 400 and 500 series, and the A3000). More recent models (eg the A5000) use IDE discs; for such models, you should set the configured number of ST506 drives to zero, and use the *Configure IDEDiscs command to set the number of hard discs. The default value depends on the model of computer (for example, an Archimedes 305 is not supplied with a hard disc, so the value is 0). Note however that a delete power-on will not preserve this default value, but will set it to zero. *Configure IDEDiscs sets the configured number of IDE hard disc drives recognised at power on. These disc drives are the standard ones fitted to more recent models of RISC OS computers (eg the A5000). Early models (eg the Archimedes 300, 400 and 500 series, and the A3000) use ST506 discs; for such models, you should set the configured number of IDE drives to zero, and use the *Configure HardDiscs command to set the number of hard discs. The default value depends on the model of computer. Note however that a delete power-on will not preserve this default value, but will set it to zero. Sets the configured step rate of one or all floppy disc drives. *Configure Step sets the configured step rate of one or all floppy disc drives to n, the step time in milliseconds. If the drive parameter is omitted, the step rate is set for all floppy disc drives. This command should only be used with non-Acorn disc drives. The setting of this value affects disc performance. The optimum setting will vary, and is not necessarily the shortest step time. The default value is 3 milliseconds. 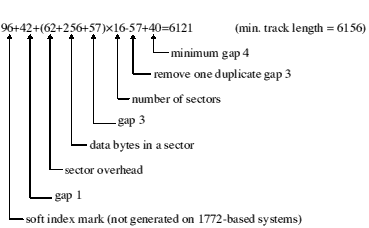 It is possible to set values of 2, 3, 6 and 12 milliseconds: if other numbers are supplied, the request will be rounded up to the nearest step available. In single and double density modes, selection of the 12mS step rate actually results in a 26mS rate being used; this is intentional to support older 40/80 track 51/4" discs. At octal density it is not possible to step at 12mS; this is a limitation of the hardware, but should not cause problems since drives capable of supporting octal density can normally be stepped at 2 or 3 ms rates. The limitations are because the step rates provided by the 710/711 controllers depend on the data clock rate selected. Before every command ADFS calls a routine to check the selected clock rate against the selected data rate and the configured step rate, and hence to determine whether the step rate needs first to be altered. *Format prepares a new floppy disc for use, or erases a used disc for re-use. Early models of RISC OS computers (eg the Archimedes 300, 400 and 500 series, and the A3000) do not have the disc drives and controllers necessary to use DOS/H, DOS/Q and F formats. RISC OS 2 only supports L, D and E formats. Newer models of RISC OS 3 computers (eg the A5000) can use all the above formats. The default is to use F format if possible; otherwise E format is used. These formats offer improved handling of file fragmentation on the disc and therefore do not need to be periodically compacted (see the *Compact command).